Creative Freedom: what is it? Who are we when we are not being tabulated, enticed, manipulated, or otherwise controlled? When are we free from all that entraps us? How much awareness can we muster and maintain around our ordinary attention, our most sacred resource? How can I use the “season of giving” to give myself and others freedom? Are we able to unlock our own cages and walk out freely? I was captivated by these excerpts from Life Style by Bruce Mau. Published in 2000, and ringing loudly true 18 years later. “Designers today experience a condition of ambiguity and compromise: building, aiding, and abetting the global image economy seem inevitable consequences of our work. Prospects of that condition changing seem remote. Nonetheless, our obligation to exploit the situation is compelling, provided, that we are willing, given our position, to recognize the potential of radical contradiction and to take an eagerly opportunistic posture in looking for the openings that appear before us. “If freedom can be defined as the ability to apply one’s energy to objects of one’s own choosing, then our attention, our time, and our energy-our most precious human resources- ought to be guarded jealously. The onus is on us to devise attitudes, postures, flexible, and imaginative strategies to exploit the situation. Do you think you can improve the world? and a time for being behind. The wise one sees things as they are without resisting or grasping. She lets them go their own way and resides in the Tao in the center of the circle. from the Tao Te Ching, by Lao Tzu. I'm making a big wet colorful mess today. Sometimes I make smooth neutral early layers, and sometimes bright and sloppy seems like the way to go. This may be a case of art imitating life- my three small children are nothing if not bright, colorful, and messy! 👍👶👶👶🎨🌈💦 after this dries, I'll figure out what to do next. Maybe collage? I'll probably try to sharpen it up with more detail. I donated a piece to the fundraising auction for TEDx Portland. Available for bidding through April 12! Turned A Corner. Wallpaper. Lists. Digressions. Songs. Turned a Corner. 22x30. Colored pencil, acrylic gouache, collage on Rives BFK. 2014. I just made this drawing and thought it might make a nice wallpaper, so here are some files you can download. And if you like to read stuff about stuff, there's more stuff after this. I've been making a lot of lists lately. I've always liked them, but they are starting to seem essential lately. I probably have at least 10 active lists going. Three or four in the kitchen, one by my computer in my studio, a few on my phone, some in my sketchbook, and then all the ones in my head that I haven't written down yet. Most of them are mundane things or big things that need to be done to get ready for our next baby. Like shopping for a minivan since we will have three kids in car seats soon. And getting more celery. And finding the play food I bought for our daughters a year and a half ago. Could be anywhere in the towers of boxes lining the edges of our basement. It might be nice to make some lists that are less pragmatic now and then. For instance, yesterday happened to be a great day to hear songs I actually like while running errands. I'm not the snobbiest of listeners, so it wasn't really about taste as much as nostalgia, and hearing those songs connected my past with my present in an inspiring way. I heard a lot of songs that I have 'history' with. So, one idea for a non to-do list might be to write down all those songs that I can remember from yesterday and put them on a playlist. And maybe make some notes about the songs. It might be fun to share with my kids one day. I digress. My biology teacher in high school used to say that a lot. 1. The lines that look like fold lines are from tiling multiple scans together. I have a regular letter size scanner, so if I want to scan a big image I tile everything together. My scanner is from the year 2000. This whole process feels very dated, but I haven't found a better solution yet if I want a super crisp image of my image right this second. I left the shadows because I liked them on this piece. Its digitally enhanced I guess. 2. This idea came to me in a way that felt very immediate and spontaneous. However, I think I am at the point creatively where ideas that feel immediate and spontaneous have been stewing for a while. To extend the cooking analogy: the ingredients have been in my imaginary pantry for a while, and now and then a new concoction turns up using the same old stuff. 3. I love drawing on paper. Its like a favorite pair of sweatpants. So comfortable. Especially right now for some reason. 4. There is something about the spatial illusion in this drawing that I really love. It feels flat, yet dimensional at the same time. 5. I'm not sure about the lower right corner. 6. I like that there is a lot of breathing room in this piece. It probably reflects the sense of relaxation and refuge I feel when I'm making images at the moment. There is a lot of stuff and noise and detail and busyness around me at the moment, and I'm learning to let my work be a form of relaxation. 7. I might add this image to an online sale that might happen before my baby is born. I will make announcements here and there online if that is the case. 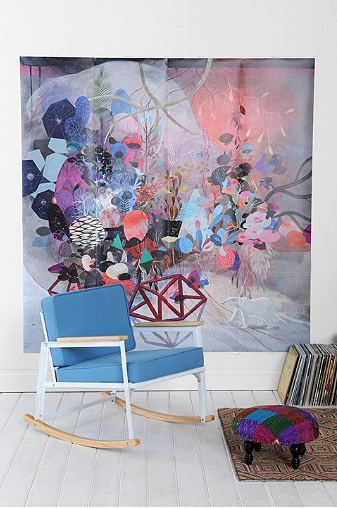 I worked with Urban Outfitters to make these giant wall murals. Available now online in their shop! I love the large scale. Observational drawing seems to overlap quite a bit with mindfulness/meditation practice. It is a constant process of noting how you perceive something, and then realizing how far off your perception is, and then adjusting and re-recording. There seem to be an infinite number of refinements that can be made to bring my notes closer to the reality that I see. What I see is always changing even if I am looking at the same thing. Nature/life is far more beautiful and amazing when I slow down and really look at it, and see how much I am missing. I like that there is a feeling of progressing towards some concrete visual goal, but I also like that this concrete place will be within the more open unpredictable space of my typical painting style. 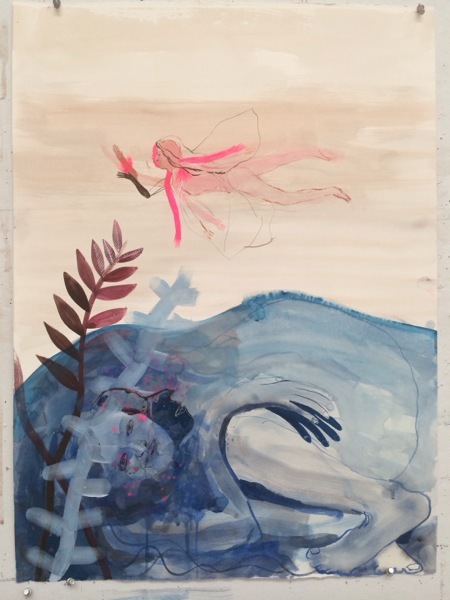 I'm thrilled to announce the opening of my show with Andrea Wan and Sandra Dieckmann. Opening Reception: Thursday February 6 from 7:00 - 10:00 pm. If you would like to see a preview of the work, please sign up for my newsletter. The work will be online for the general public sometime later this week. Get your holiday orders in by 12:00 pm PST on 12/12! I'll be on holiday break for a couple weeks starting 12/15. I'll start shipping again in January! 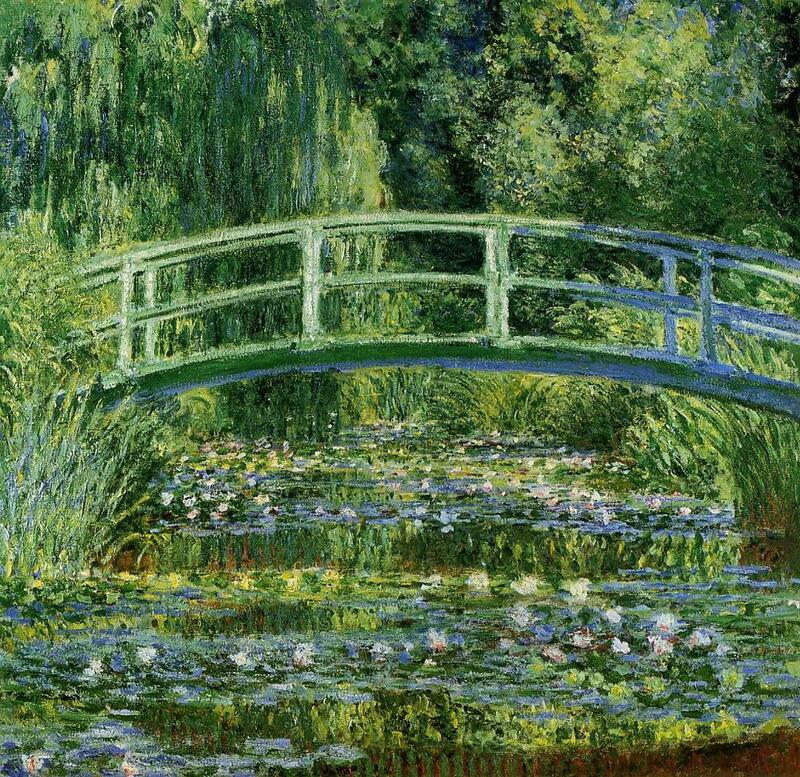 As a kid, I had a book of Impressionist paintings with a color plate of one of Monet's paintings of the Japanese bridge in his garden at Giverny. I loved this image. I'm pretty sure that image attached is The One. Its one of the first paintings that moved me. I watched an episode of The Mindy Show recently in which Mindy was ridiculed by a snobby cultural writer type for liking Monet's paintings of the bridge (my hazy recollection). Oh, the sting of a critique of your first love. In college, I was warned by an instructor that using green in an image was risky and almost certainly doomed to failure. As it happens, I'm using a lot of green in a painting at the moment, and finding that it is cropping up quite a bit in all areas of my life. Pantone's color of the year is Emerald. Sounds about right to me. It's hard to say for sure, but I seem to be leaning into green. I'm not going to let a fictional jaded snob or a moment of questionable pedagogy limit my creative explorations. I've listened to a lot of dharma talks in the past five years or so. These talks, in combination with my intermittent meditation practice, have led me to an interest in the relationship between non-dual awareness and the dualities we experience in everyday life. In other words: I'm experiencing all the good things and the bad things that happen in an average life, while noticing that there is a third layer of consciousness of our daily experiences. When I look at this image, that's what I think about. The neon lines can be seen as the light of consciousness, the waves can be seen as the ebb and flow of different states of being. I plucked a few quotes from A Short Guide to Writing About Art by Sylvan Barnet. Just picked this up last night. Pairs well with back to school season. "A picture is not thought out and settled beforehand. While it is being done, it changes as one's thoughts change. And when it is finished, it still goes on changing, according to the state of mind of whoever is looking at it. A picture lives a life like a living creature, undergoing the changes imposed on us by our life from day to day. This is natural enough, as the picture lives only through the man who is looking at it." "No two people see the external world in exactly the same way. To every separate person a thing is what he thinks it is- in other words, not a thing but a think"
Wishing you peace and productivity. This quote is apt for my life right now. I'm trying hard to nurture all sorts of beginnings, and I definitely do not know which seeds will sprout and thrive. 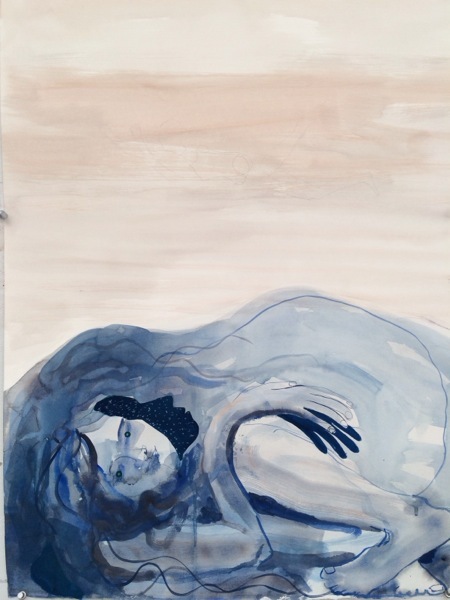 Since the birth of my twins, I've had limited studio time, and I found that the whole experience was such a game changer (an understatement if ever there was one) that painting took on a new role in my life. I was back to painting solely for the pleasure of it. I had (and still have) limited time and energy, so for the first year or so I focused on what I could make within my new parameters of exhaustion and 15 minute increments of free time during which I also needed to eat and take a nap. One of the things I can take away from this experience is an appreciation for the value of limits in the creative process. I have had so much freedom in my life and work, which is wonderful, but limitations force a person to be inventive and challenge her habitual approach. I have been able to get a fresh perspective on the work I have already done, and find a bunch of new seeds that I'd like to plant. I started this piece early in this period. As the demands of the first year with twins escalated it fell by the wayside with the rest of my life. Things have gotten much easier with the kids, so over the last few months I've been picking up several unfinished paintings and wrapping them up. This one was 95% done, so it was just a matter of adding a couple layers and calling it good. I have a few loosely organized investigations happening in my work, and this one is part of my interest in developing patterns. I love making patterns. I'm not sure I'm quite up to making this into a repeat yet, but I'm getting the hang of it, and I think it would be a great pattern for fabric, or wrapping paper, or packaging, etc. One of the challenges with it is balancing the scale, direction and the colors so that it feels 'right'. Its a complex image, and that seems harder to manage once its in a repeat. I'll just let it be for now, and when the time is right I'll try to solve the pattern piece. Thanks for spending some time here. I've been enjoying flowers lately. I don't think I will be able to exhaust their potential as a source material for a long time. I tend to oscillate between a few areas of interest from painting to painting, but I think I will be returning here often. 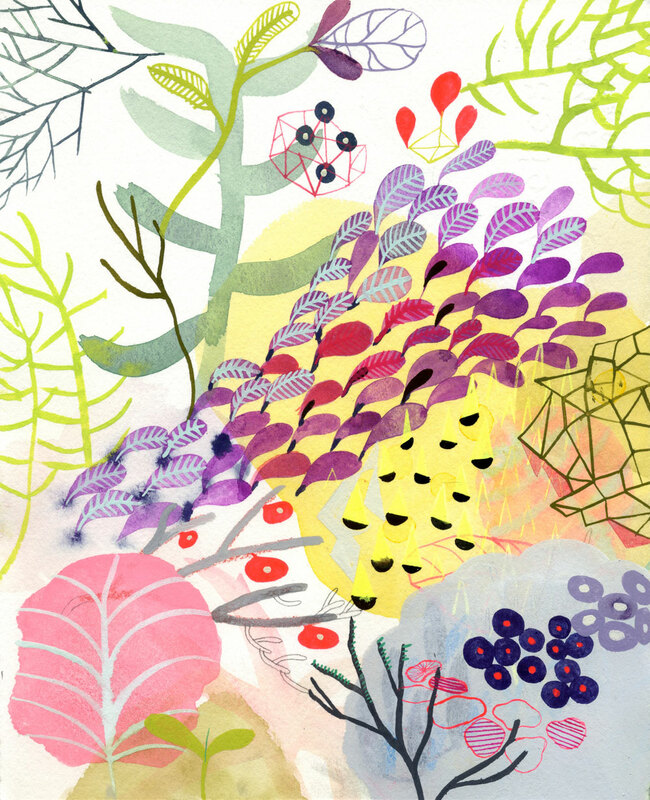 In this piece, I worked with washy watercolor backgrounds, silhouettes of plants, and intense color. Its my happy place.